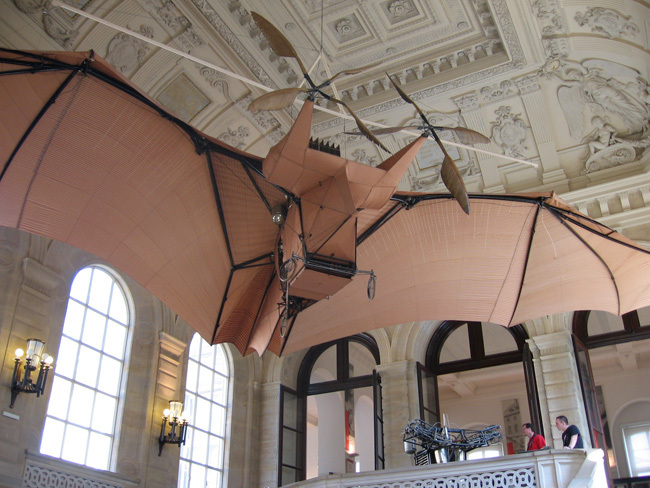 I'll write up a whole article about the wonderful Musée des Arts et Metiers sometime soon, but for now I'd like to focus just on my favorite exhibit there: a marvelous bat-shaped plane called Avion III! Avion III  "avion" being the French word for "airplane" (and, uh, "III" being the Roman numeral for "three")  was built by French engineer Clément Ader between 1892 and 1897. And while it looks more like something out of a steampunk dream than a real working airplane, Avion III is no sculpture; this steam-powered aircraft really flew! A little research tells me its construction was financed by the French War Office, and I can only imagine what the heck they wanted to do with it. You can just imagine a fleet of these spooky things defending Paris against, let's say, a bunch of mechanical-werewolf-shaped German tanks! Er, well, that's what I imagine. Anyway, I'd lived just around the corner from the Musée des Arts et Metiers for half a year without making the time to visit, when a brilliant friend of mine back home told me it was his favorite museum in Paris and that I absolutely had to see, among other things, the gorgeous bat-shaped airplane they have, with its translucent fabric wings and propeller blades carved like feathers. I was sold! And Avion III didn't disappoint; on the contrary, after hearing about this plane a few time, I'd sort of forced myself to not get my hopes up and to imagine something much more practical-looking and less fantastical, and when I finally saw it with my own eyes I was very pleasantly surprised at how strange and spectacular the design of the thing actually is. It's downright jaw-dropping the first time you see it, and the beautifully sculpted ceiling of the huge room the plane is displayed in lends even more drama to the scene. While the plane itself is hanging high above, its steam engine has been yanked out and installed at the top of the stairs nearby, so you can take an up-close look at its workings and read a bit about the plane's history on the signs there. 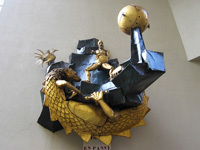 And the rest of the Musée des Arts et Metiers is a real treat, too, so definitely stick around and do the whole tour. 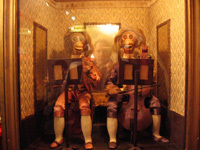 Some of my other favorite pieces in the Musée include a small roomful of creepy automata, a few shadow puppetry masks and props, a handful of primitive movie cameras, and much more. 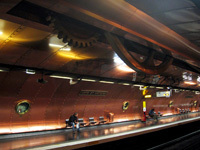 Also, if you're a fan of steampunk stuff, don't miss the cool decor of the subway platform at Métro Arts et Métiers right out front; it's like something out of 20,000 Leagues Under the Sea!